THE next Digital Editors' Network meeting will be looking at the legal risks newspapers and media organisations face as they expand into an ever increasing array of new media platforms. Blogs, comment boards, forums, digital archives, links to third party content and the speed of breaking news online are all providing us with fresh legal challenges as we straddle the divide between traditional media and online communities. The meeting will welcome some high profile speakers from media law experts Wiggin LLP at the University of Central Lancashire, Preston, on October 7 where we will look at some of these issues. Caroline Kean, Wiggin’s head of litigation, will lead the discussion at the Digital Editors’ Network meeting and draw on her experience of media lawyer, as her work has seen her act for national and regional newspapers, magazines, book publishers, television and film companies. Caroline has been acclaimed as one of the UK's top female solicitors and is vice president of the Media Society and legal advisor to Women in Journalism. The Digital Editors’ Network will also include a showcase of new ideas from around the regional media, more details on that to follow. The Digital Editors’ Network is a free event supported by the journalism department at UCLan, Preston. 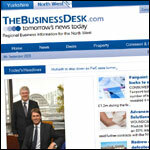 I AM sure a few people will be interested to click around the newly launched thebusinessdesk.com website which has opened up a North West based service alongside its existing Yorkshire site. How-Do has a bit of background on the people behind the site and it offers a clean and crisp design, with some interesting news articles running through it. Not too sure the request to register for a free account to read the full story is very user friendly, I think such a step dramatically reduces the chances of other sites and blogs linking to you. Personally I wouldn't be happy sending people to a site where they were being asked to register details to read a story, the connection I have with readers is too valuable for that. I HAVE just spent an entertaining few hours talking about all things internet and blogging as part of an event hosted by How-Do. The talk, titled Managing Reputations Online, aimed to look at how to track and be involved with online networks and communities. I WILL be taking part in a talk about how businesses can manage their online reputation in an increasingly fractured media world, where everyone can attract an audience. Speaking from a publishing and blogging perspective I will look to highlight many of the new ways people are connecting up, as well as why that might be the case and steps that businesses can take to be part of this. Afterwards a Q&A session is timetabled to last 45 minutes which is the bit I really enjoy and it will be interesting to listen to the experience of others and maybe point out a few solutions. The event takes place at the offices of TBWA in Didsbury, Manchester on June 4, and tickets cost £60 (plus vat) with refreshments and lunch included. HAVE a guess when my newsletter goes out? If there is one thing I stress to any website owner big or small it is the importance of offering a newsletter service.